90 Klumpp Road, Upper Mt. Gravatt. Sign up with your email address to receive email alerts of upcoming clinics in 2018. REMINDER: After submitting, we'll send you an email. Please confirm subscription! You will be receiving a confirmation email, check your junk mail if you don't receive it soon, please confirm using this email. If you have subscribed before, you won't receive the confirmation email. Fast-paced high repetition drills for 9-17 year old boys and girls. Advanced and beginner level sessions focusing on fundamentals every Saturday and Sunday morning. What is Get Out Get Active Basketball? GOGA Basketball is a fun and inclusive free basketball program for women and girls of all ages and skill levels who would like an opportunity to get out and active with their friends or to meet new people funded by the Queensland Government. 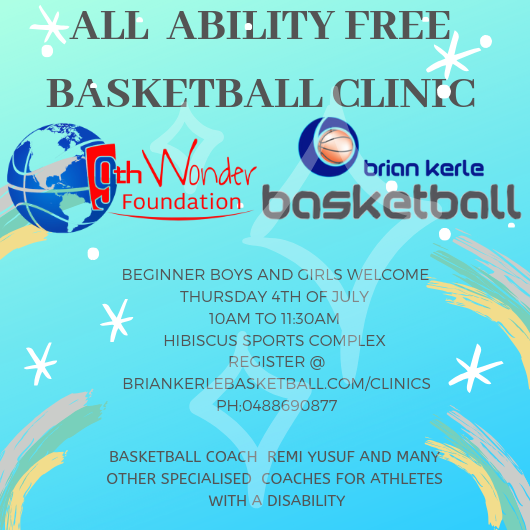 Brian Kerle Basketball holiday clinics.